Compromised or missing teeth can cause a host of complications, like difficulty speaking and having trouble eating. Dental implants directly address many of these common issues, returning functionality back to the smile. At Appleton Prosthodontics in Baton Rouge, Dr. Richard Appleton and his staff replace missing teeth for patients with dental implants. Dental implants are prosthetic restorations crafted to replace missing teeth. These restorations are made from three main components: the implant post, making up the root of the tooth, the abutment and the crown, which makes up the chewing surface. The implant post is made from titanium, a material containing unique properties that fuse with bone to create a strong structural foundation. The abutment is placed atop the implant post and connects the visible chewing surface to its supporting structure. The dental implant restoration, such as a crown, is placed over the implant post(s) and abutment(s), making up the top part of the implant. Why Choose Dental Implants Over Other Restorations? While many treatment plans can improve a patient’s dental health in the case of missing teeth, no restoration in modern dentistry is as comprehensive in nature as dental implants. Dr. Appleton offers a free exam and consultation for those considering dental implants. He also works closely with a local oral surgeon to coordinate treatment and ensure patients receive high-quality care that meets Dr. Appleton’s standards. Come to Appleton Prosthodontics to find out if you’re eligible! 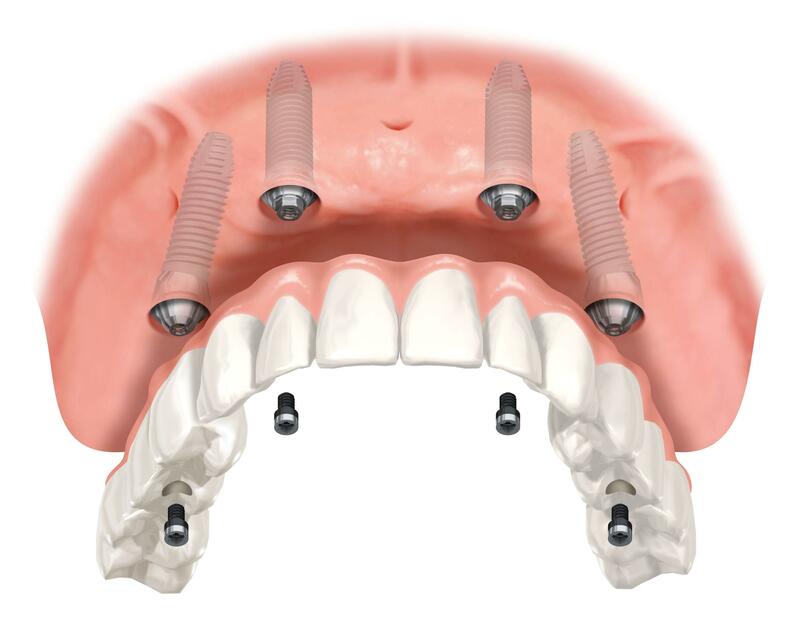 All-on-four and six-implant prostheses give patients an opportunity to receive treatment to replace an entire row of missing teeth using only four to six dental implants. Patients missing several teeth up to an entire arch can look forward to complete dental rehabilitation using a combination of dental implants and dentures. Dr. Appleton specializes in administering all-on-four or six-implant prosthesis to generate an implanted-supported denture made to last a lifetime. Visit Appleton Prosthodontics in Baton Rouge and schedule an appointment with Dr. Appleton to receive a free exam and consultation on us. Find out how dental implants can improve your quality of life today!